Good quality ACOG style scopes? Hey guys i recently got myself a nic new G&G SIG 553 and it is a dream! The only thing i am missing for it now is a decent scope. I fancy an ACOG style scope with magnification so i can see targets at a distance better. Can anyone suggest some decent ones for me ?? thanks. Just shop around. As far as I know they're all the same regardless of manufacturer, just make sure you get one with a zoom. There are a few different styles of ACOG as well, some have the fake fibre optic piece, some have back up iron sights on the top and some have mini-red dot 'docter sights' on them instead. I have an ACM on my L85 and I've got another for sale, if you're interested? I also have another ACOG, unsure of the manufacturer, for sale too. There's a slight crack in the front lens of the ACM one and the vertical adjustment turret doesn't seem to work for some reason... But you're welcome to it for £50 - postage included in the price. If you pay the fees. It's in the style of the ones with the fibre optic piece. The other one is pristine, no cracks, adjusts fine, but it's slightly misty on the inside for some reason... Kinda looks like you're peering through fog when you look through it. This one doesn't have the fibre optic piece, but it has some iron sights on the top instead. It's also with a friend at the moment, might be a while before I see him again to get it back. I'll do it for the same as above, £50 including postage, if you pay the Paypal fees. well most people buy cheap ones off ebay, because a) they just want the look, and its cheap as hell. Here are 3 examples from a quick ebay search. alot of those clones that people have are basically these just with a different brand slapped on them with a higher price tag, but what can you expect thats just how people roll. These are cheaply made, can last a while. but dont be to surprised when they break, like i said they are cheap to buy, so cheap to replace. Or you can be like me, Because i own a firearm license, i had the luxury Of owning a straight pull rifle, which i got second hand which also came with a used trijicon acog. they cost a pretty penny in real life, but you can get them second hand for an ok price if you look. on the plus side to owning one of these, i can tell you they take one hell of a beating, ive used mine on my rifle shooting out 7.62 ammo all day long, then taken it off and used it on a airsoft gun for a weekend event. The only issue with ACM/clone optics is you're somewhat rolling the dice on whether you get a good once, because they might all roll off the same production line but in China that's no guarantee of anything. With that in mind, where possible I'd say it's going to be the sort of item you should probably try to get 2nd-hand from somehow who's already looked through it and can confirm that the glass is clear and it all works as it should. 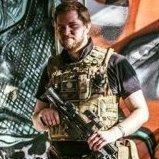 Thanks for the replies guys i got myself a nice Trijicon scope for 65 quid at my local airsoft site and it is brilliant.